Here’s something I saw on Facebook. At first, this dark humor had some appeal to me. But then my brain kicked in. If dinosaurs lived 200 million years ago, how can a couple million years late really matter to a star? The short answer is that the image above is pseudo-science post junk. Here’s how wrong it is. Our Sun is about 4.5 billion years old and will continue fusing hydrogen into helium at a rate of 600 million tons per second for another 5 billion years. 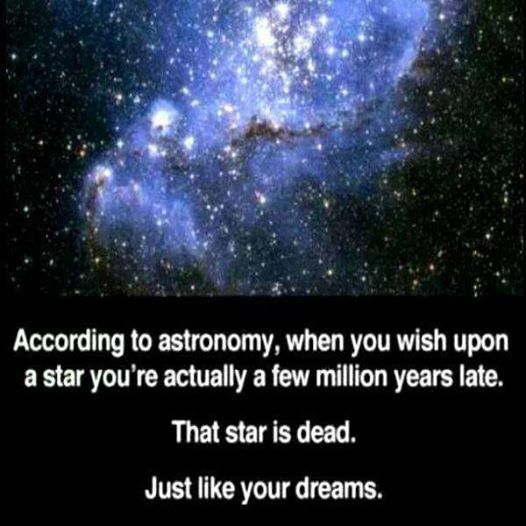 So a few million years is not long enough for a star to burn out. Our closest star, Alpha Centauri, is only 4.4 light years away. That means if we wish upon Alpha Centauri tonight, the light we see has been traveling for only four years to get to us, not millions. With the right telescope, we can see back to the edges of the big- bang. But, let’s assume we wish upon stars with our naked eyes. The vast majority of stars we would see are in our own galaxy, the Milky Way. It has 55 billion stars, but is under 120,000 light years across. So the light from any star you choose in the Milky Way is much less than a million years old, and much much less than the star’s life span. What about galaxies beyond the Milky Way? Of the estimated 100 billion other galaxies in the observable universe, only one, Andromeda, can be seen by the naked eye in the northern hemisphere. Andromeda is 2.5 million light-years away from us and looks like a fuzzy star. With the naked eye, you are more likely to see a planet than another galaxy. About one star is born and another dies per year in the Milky Way. So your chances of finding a dying star are, at best 1 per year X 120,000 light-years / 55 billion stars, which is 0.00002%. I think it’s safe to say that the astronomical claim in the top graphic is complete garbage. So why does this matter? Because scientific literacy matters. Social media makes us all broadcasters — international media outlets. If we repost the graphic above without comment, aren’t we all contributing scientific illiteracy in our own way? What are your favorite examples of post junk?